We hope you enjoy your visit here. Please join or login if you have joined before. 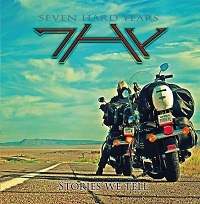 7HY (SEVEN HARD YEARS) and their album “Stories We Tell” has blown me away. Shawn Pelata's vocals are the stand out here. Imagine a combination of Steve Perry mixed with a little Tate and Tobias (EDGUY) and you'll have a good idea of what to expect. His voice is clear, concise, and he can hit the high notes. However, it never gets too high or corny sounding. In fact, his voice is just the perfect pitch; not too high but not too low. They would probably be best described as Melodic Hard rock, as their facebook page would suggest. They are not super heavy; the vocals may teeter on Power Metal but the drums never get that fast. The guitars, as poignant as they are, never delve into true Metal territory. However, they are definitely too hard to be called rock. Their sound is best describe as JOURNEY if they had a lot of coffee one day and were somewhat hyper for a few hours. Unfortunately some times the music gets a little cheesy. If Pelata is the star of the show then his co-star is guitarist Alan Kelly. The riffs are simple but very effective, allowing a heavier back drop for the soaring vocals that ride upon them. Even more so than the riffs are the guitar solos. Melodic with a hint of blues at times, these are the glue that hold the songs together. Much like BLIND GUARDIAN, the solos are more often than not extremely catchy and very “singable.” Kelly also handles keyboard duty. They have a very late 70's early 80's feel to them, really adding to the over all atmosphere. I can really hear some of these key “riffs” being on an album from JOURNEY .38 SPECIAL, or SURVIVOR (not an insult, I promise!). “Broken Man” has stand out keyboards that propel the song along while the guitar stays off the distortion peddle and sounds like a smooth dream scape mixed with Pelata's vocals. One thing of note is the bass because you can actually hear it. The crystal clear production lets the bass shine and is fun to listen to, often times jumpy and melodic. As talented as the band is, it always seems like they just on the edge of really kicking their sound off to a full start. If more of the songs were like “Church” then I think it would really help set them apart from the more cheesy 80's style moments. This song features double base, pounding drums, some fast riffs and blazing guitar solos. Although there isn't a bad track, a few of them are too close to 80's power ballad territory, such as “Only Human” and “Driving Me Crazy.” They aren't bad songs per say but when I listen to them, I can't help but feel I should be in the parking lot of a beer joint, standing in front of a classic car, while singing towards the sky. All in all, the individual talent on this album is apparent and it is a really great listen, especially if you are into late 70's/early 80s Hard Rock. The crystal clear production and guitar riffs help keep it modern although sometimes things get a little too cheesy, especially if the keyboards are more prominent when the guitar isn't really providing riffs. However, it is a great release and I wish to see the band keep going and maybe expand a bit more.